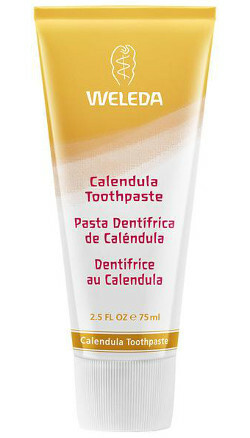 Weleda Calendula toothpaste gently cleans your teeth using natural chalk. Regular use helps protect against build up of plaque and is free from fluoride, detergents, synthetic fragrances, colors and preservatives. Ingredients: Water (Aqua), Calcium Carbonate, Glycerin, Magnesium Aluminum Silicate, Alcohol, Calendula Officinalis*, Commiphora Myrrha*, Foeniculum Vulgare (Fennel)*, Xanthan Gum, Ammonium Glycyrrhizate, Limonene. *from natural essential oils.